I tore through this book. I could not wait to find time daily to read. Blink resonates with me so much because I am constantly talking to people about “trusting your instincts” and not trying to over analyze things or collect more data, and more data, to make a decision. 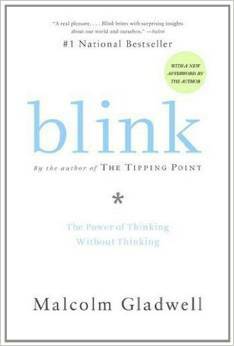 Blink has the research to support my thinking. Thank you Malcolm. I devoured the first half of the book and then read the rest. The first half focused on the power of knowing in the first 2 seconds and that it is not a gift given to a fortunate few people but is naturally in all of us. The chapter on ‘thin slicing’ was very interesting. This is the science / art of breaking down what you see into thin slices. One research project he looked at was on the ability to predict which marriages were most likely to last over 15 years. The researcher had the husband & wife talk about something in their lives and he videoed them and broke the conversation and faces down into ‘thin slices’ and what he determined was there are Four Horseman that can be identified by watching closely to what is said, how it is said, and facial expressions. And they happen instantly. The Four Horseman are defensiveness, stonewalling, criticism, and contempt. You can catch these in a blink of time. We also make “blink” decisions for the wrong reasons and can be fooled by people simply by their looks. One research he showed was the lack of women in orchestra’s until they held the auditions behind a curtain and only listened to the music they played. A few years later, about 50% of the orchestra’s were women. Our instincts have kept humans alive for years. Pay attention to those clues you get, trust your hunches but beware of being fooled by the Warren Hardings of the world (you will have to read the book or email if you want to know what means :-). All in all, I really enjoyed this book and recommend it to you for a great thought provoking book.